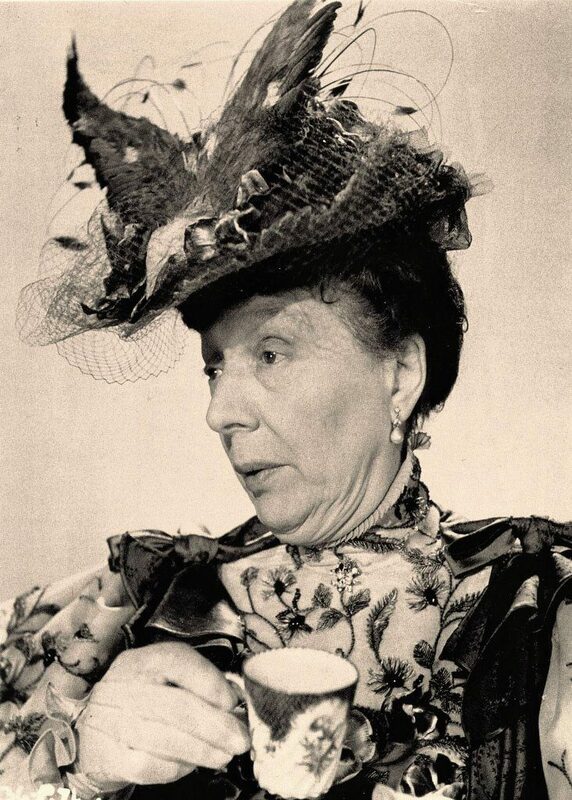 The #MeToo movement is empowering women today, but in the early 20th century ladies didn’t have social media - they had very sharp hatpins. Skip to the end to watch the video. Hell hath no fury like a woman armed with a fashionably destructive accessory. 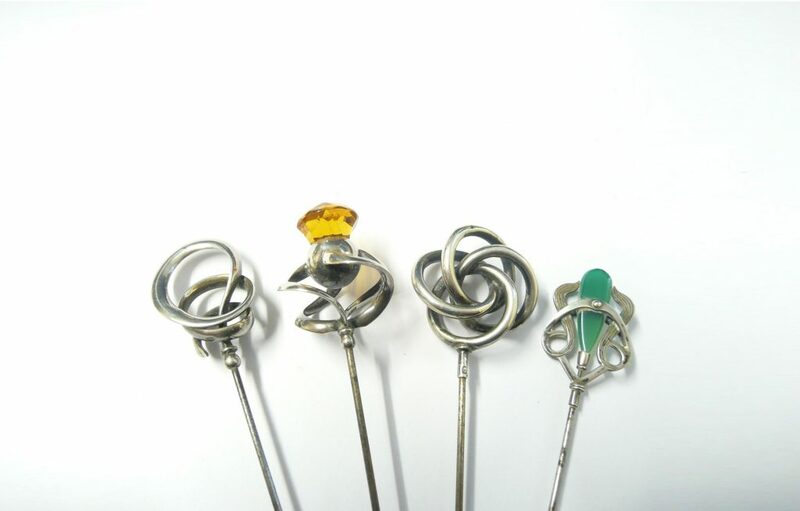 Dangerously deceptive was the early 20th-century trend of hatpins. Although perceived as a delicate compliment to an immense hat, the hatpin was more of a silent form of protection for women against a possible threat. According to RAINN, an anti-sexual violence organization, a person is sexually assaulted every 98 seconds. Unfortunately, out of 10 reported rapes, nine out of them are women. The latest stories of entertainment cornerstones such as Bill Cosby and Kevin Spacey being accused of sexual misconduct is abundant. Daily, there are new statements that reveal disheartening accounts of women being raped, molested, and sexually assaulted by high profile men. Enraged by this growing number of women being taken advantage of, the #MeToo movement was formed as a platform to shed light on the severity of sexual assault. Survivors are now able to destroy their assailant’s reputation through social media exposure and affirmative action. Their voice has been used as an armament of advocacy. Society has come a long way in comparison to its rather oppressive beginnings. 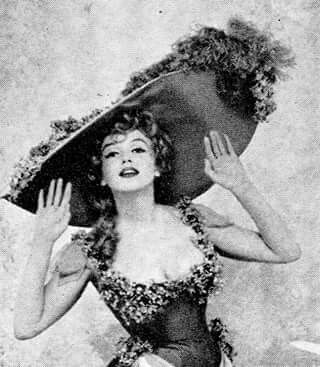 Rather than social media and hashtag movements, the 20th-century city-chic woman expressed herself with exaggerated hats. 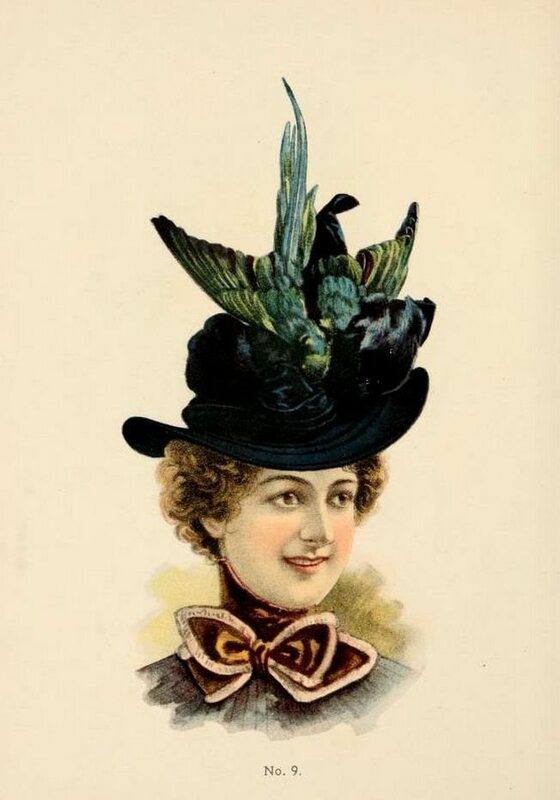 Frills, flowers, and even the occasional bird feather created a crown of adornment for forwarding-thinking women. Truth be told, these hats had a mind of their own as they would frequently fall off. 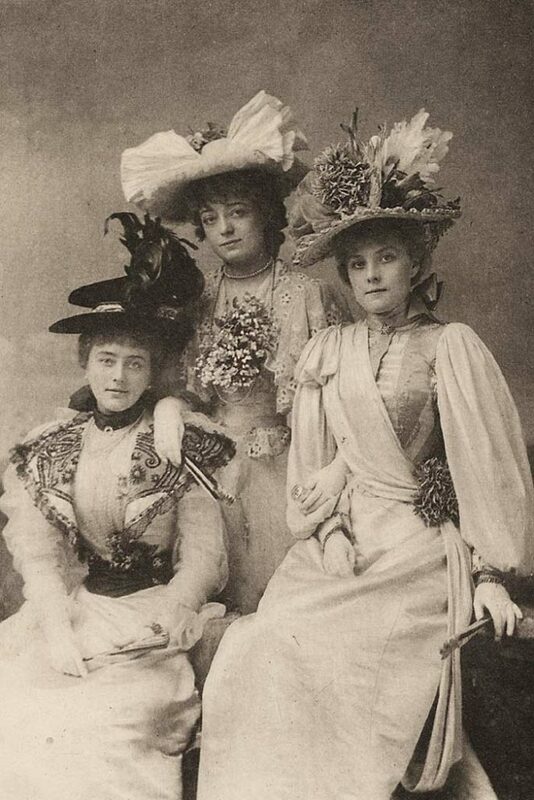 In the early 1900’s, the hatpin, which evolved from the traditional decorative pin, was reintroduced as a means to secure the flashy hats in place. 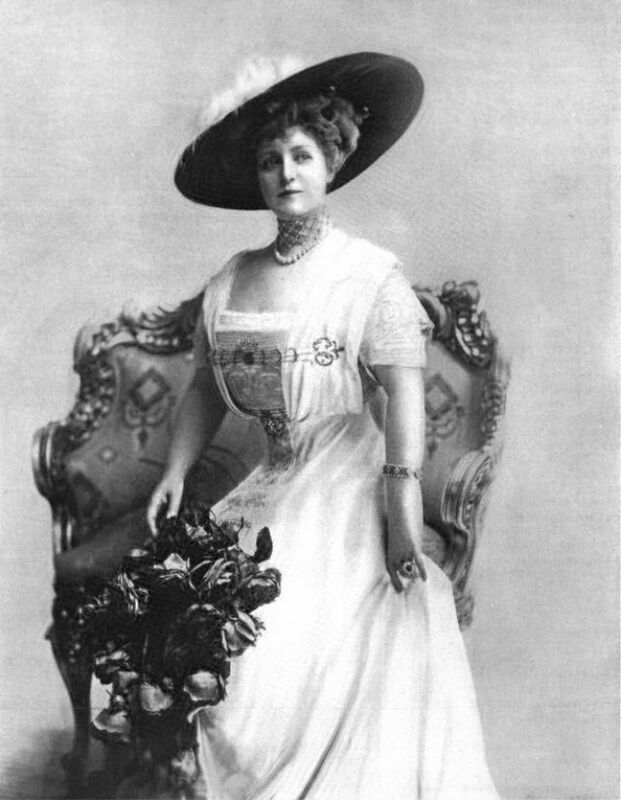 Renowned actresses Lillian Russell and Lillian Langtry popularized the trend by wearing unique, ornament adorned hatpins with their avant-garde hats. Although harmless in nature, how did these intricate placeholders become a revolutionary staple in the feminist movement? The idea of women being subservient members of society was abundant throughout the world. Despite these traditional limitations, women began fighting back and demanding equal rights. 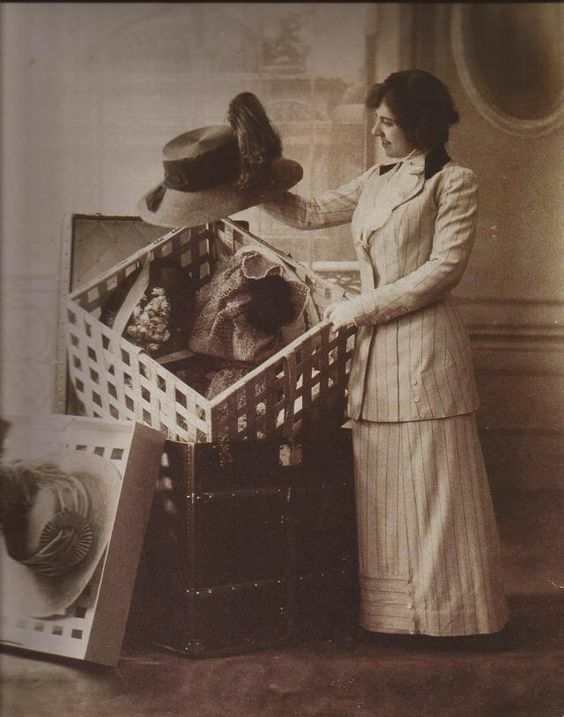 By the late 1880’s, women were enjoying the mundane joys of life without needing the accompaniment of a man. 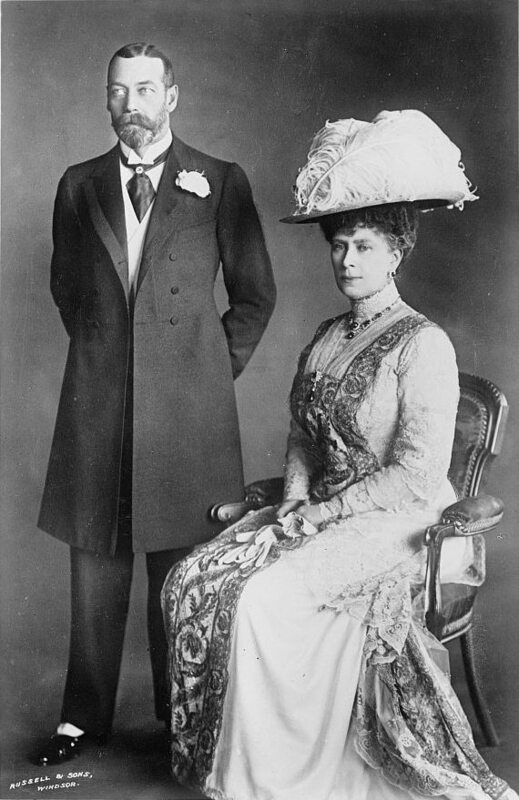 1891 marked the year when women were legally allowed to leave their husbands in Britain. The social climate in the United States was filled with copious change as women began gaining financial independence through employment outside of the household. 1890 was a year charged with progressive thinking as revolutionary women like Jane Addams and Ellen Gares Starr fought to provide women with the opportunity to occupy stable positions in social activism. Through this, women had a valid political platform that made their voices matter. Women became increasingly comfortable with organizing campaigns for cultural change and leading a self-sufficient lifestyle. Needless to say, the traditional role of a woman in America was adjusting to meet a more modern standard. 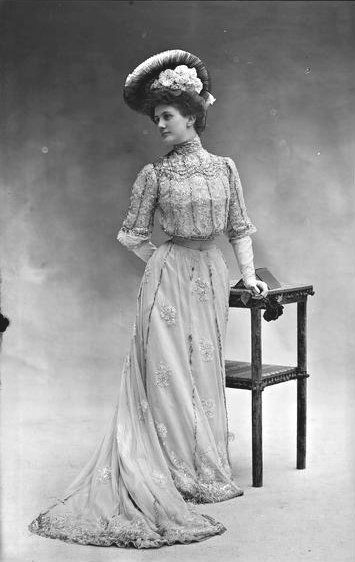 In 1904, women who walked alone were instructed to avoid tempting makeup, dress in a humble manner, and even cover their ankles. Mashers weren’t instructed to deaden their members or cover their intentions. Rather, the responsibility was on the woman to denounce her freedom and dodge attracting attention. Women had to take action to defend themselves if they were to fight for their freedom of style. 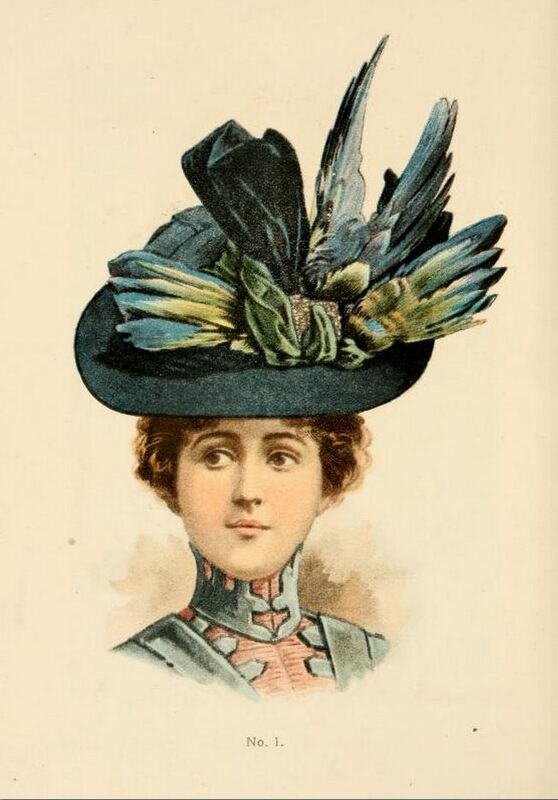 The hatpin was introduced as the steadfast savior for women’s protection. 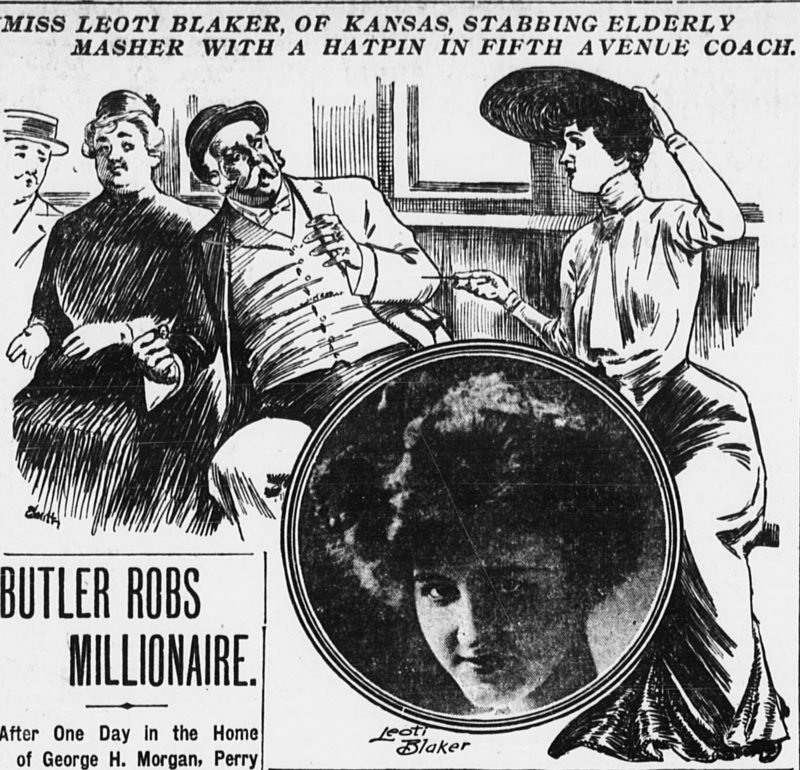 In 1903, the New York World newspaper reported the account of Leoti Baker. Originally from Kansas, she unknowingly assumed that men in New York carried themselves in a diplomatic manner. 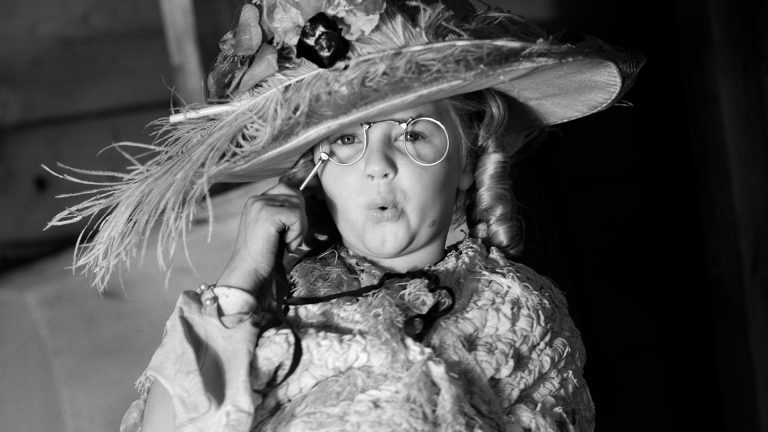 She climbed into the crowded stagecoach and ventured off to Fifth Avenue. 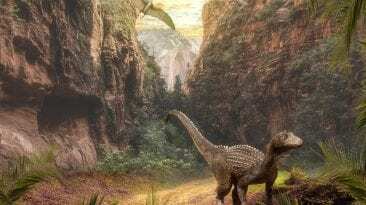 A stagecoach was intimate in nature and was led by two horses. 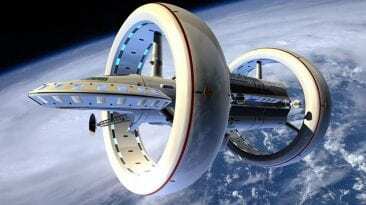 Naturally, the ride wouldn’t be silky smooth. As the stagecoach began to experience turbulence, the “nice-looking old gentleman” as she described him, began to sit closer to Baker. As the horses began to run faster, passengers on the coach were thrown about. Although an uncomfortable situation, the older man used this confusion as a means to gain a free feel. His hips and shoulders began to touch hers, and his arm somehow caressed her lower back. Evidently, she wasn’t in Kansas anymore. The term masher was used to describe predatory men who would aggressively approach women with sexual intentions. The assertiveness of these mashers ranged from inappropriate questions to outright physical contact. They fooled the public as their appearance was engaging and gentleman like in nature. Presumably, they would have been attractive to potential mates had their intentions been pure. Women across the nation began utilizing their hatpin as a means of self-defense against these intruders. Similar to modern day self-defense classes, women released printed illustrations on how to properly use the hatpin in threatening situations. 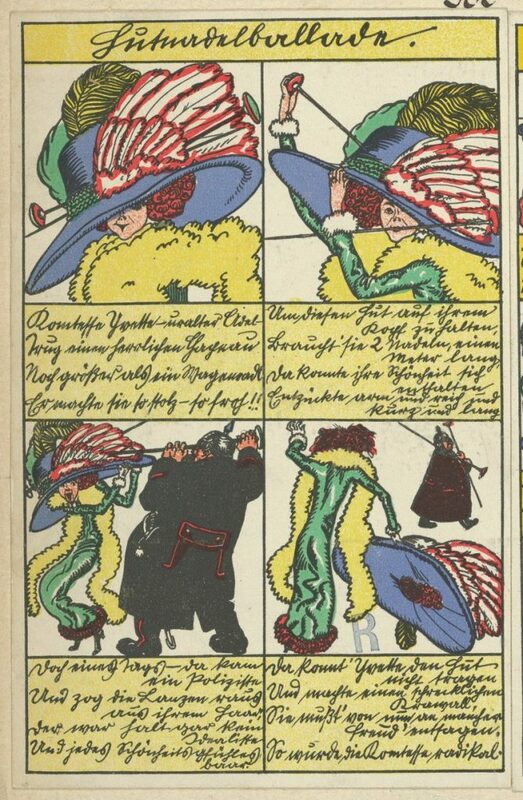 In 1904, Mademoiselle Gelas created a creative and extremely detailed guidebook that gave women specific instructions on how to defend themselves. From utilizing their hands as a means of support to opening an umbrella in a potential assailants face, this karate type approach gained recognition. Although the hatpin was able to aid women in their fight against attack, this sharp accessory began to gain an ill reputation. 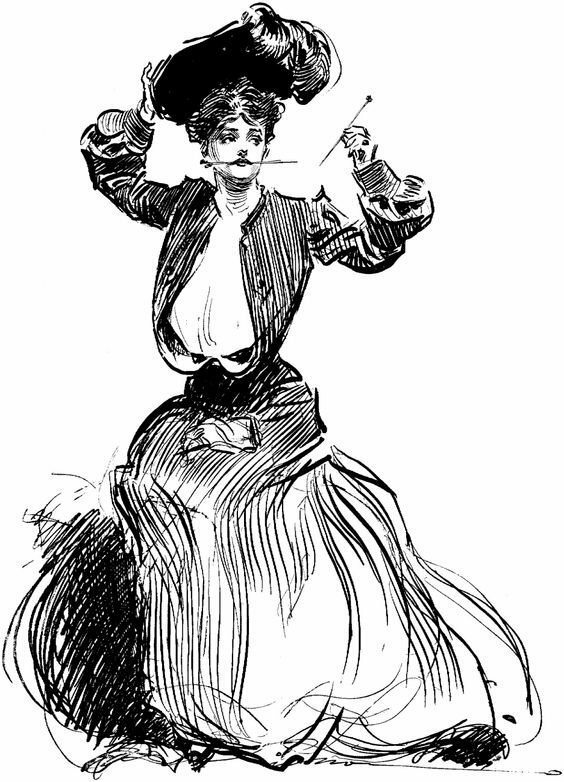 Popular artists depicted the comparison of the hatpin to diminishing masculinity. The fashion trend evolved from a fashion statement to a political tool used to advocate equality. 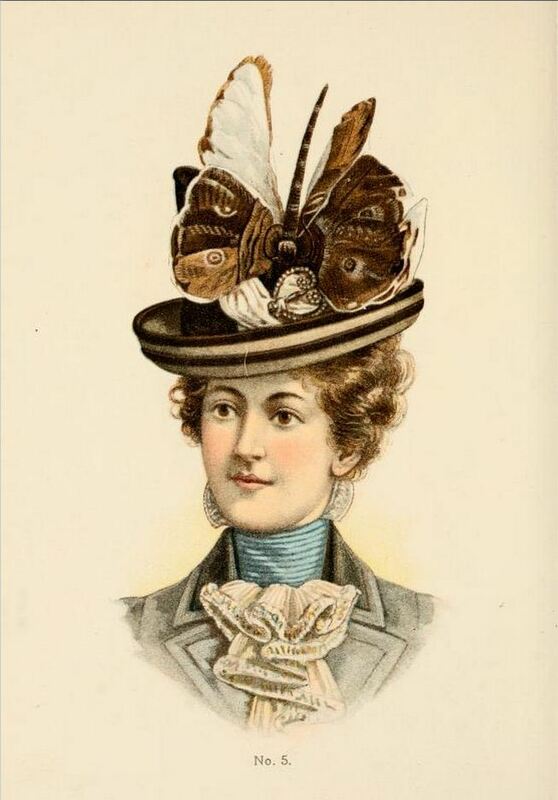 In other instances, the hatpin was the cause of many accidental deaths. A young woman accidentally stabbed her boyfriend while engaging in play. 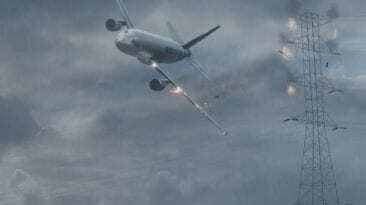 Unfortunately, this spirited action resulted in his untimely death. Similarly, while riding a stagecoach, a woman’s hatpin unintentionally cut an innocent travelers ear. 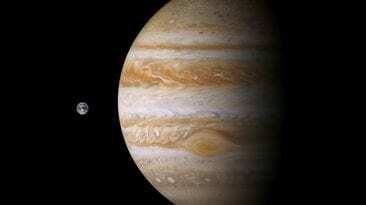 The man sadly died as a result of a bacterial infection. Women also began using the hatpin to defend their household honor. One account speaks of a jolting match between a wife and her husband’s mistress. 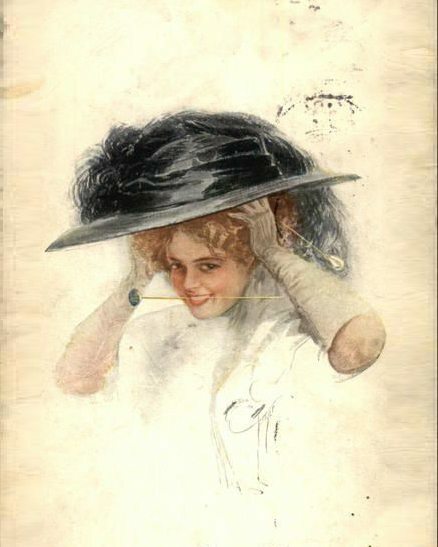 As more and more accounts of men and even other women, being attacked by the elusive hatpin began to populate, lawmakers began to take action. Hatpins now had a legal limit; nine inches long. 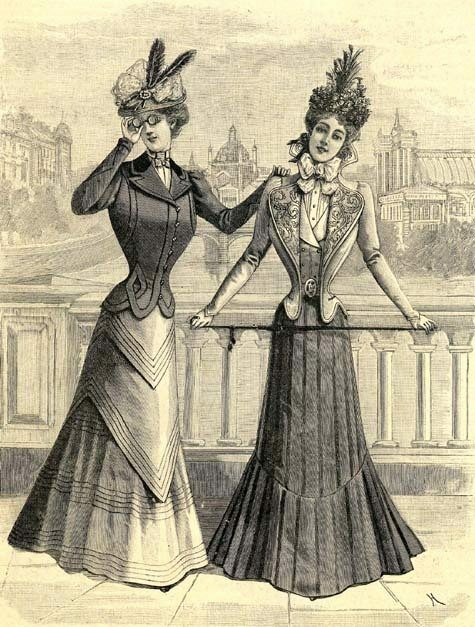 If women were caught with a hatpin over the designated length, they were forced to pay a $50 fee. 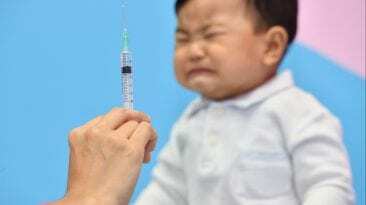 The implementation of this new regulation began in Chicago in 1910. A heated council meeting resulted in an exchange of brutally honest dialogue between male city council members and women’s activists. Nan Davis, a social activist for women’s rights elegantly penned a letter to the council with her candid expression. She wrote, “If the men of Chicago want to take the hatpins away from us, let them make the streets safe. No man has a right to tell me how I shall dress and what I shall wear.” This debate sparked national tension as women from Chicago to Arkansas began speaking out against their need for protection. This movement wasn’t focused on women being able to wear what they wanted. Rather, it centered around safety. Women wanted to be able to engage in everyday activities without feeling vulnerable to an attack. The spectrum of sexual harassment was broad and muddy. One individual may deem “cat-calling” as harassing, while others only view outright physical contact as inappropriate. In the early 20th-Century, matters of sexual misconduct were rather taboo. 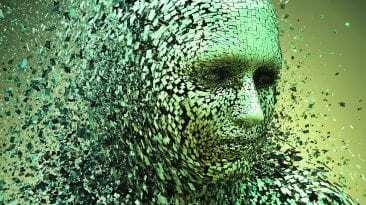 Mashers were hard to define and ultimately, women were to blame for these occurrences. It seemed as if the blame was unwaveringly placed on the women, while the mashers were seen as harmless victims. However, an Omaha judge implemented a sliding scale of fees that men had to pay for allegations of sexual harassment. This created a mild to a severe grading system that held mashers accountable. For example, if a man called a woman “baby-doll” or other derogatory calls in public, he was forced by law to pay five dollars. Today, that fine could be equivalent to exactly $124.60. The anti-masher movement sparked public change for women seeking justice for sexual misconduct. Since the hatpin was being controlled by law enforcers across the nation, women needed to find others means towards self-defense. Ironically, many public media outlets sided with the intentions of the mashers. A brutally honest article in the New York Times quoted, “A man would not be a very good one,” if he controlled himself in the presence of a woman. Clearly, women’s rights were not taken seriously as the natural implications of the male species were tolerated. If the mashers weren’t being prompted to change, women had to alter their approach. 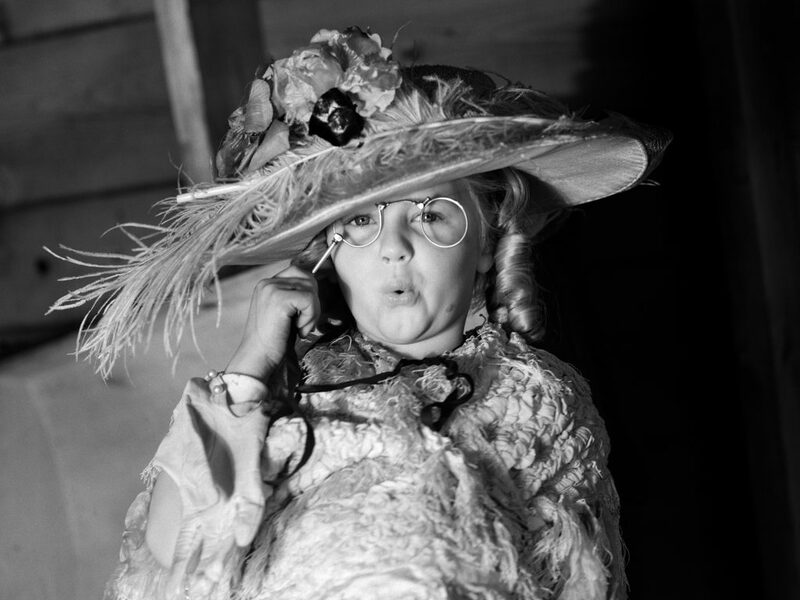 Defense mechanisms such as whistles were encouraged to replace the taboo hatpin. Women even utilized yelling to repel mashers. 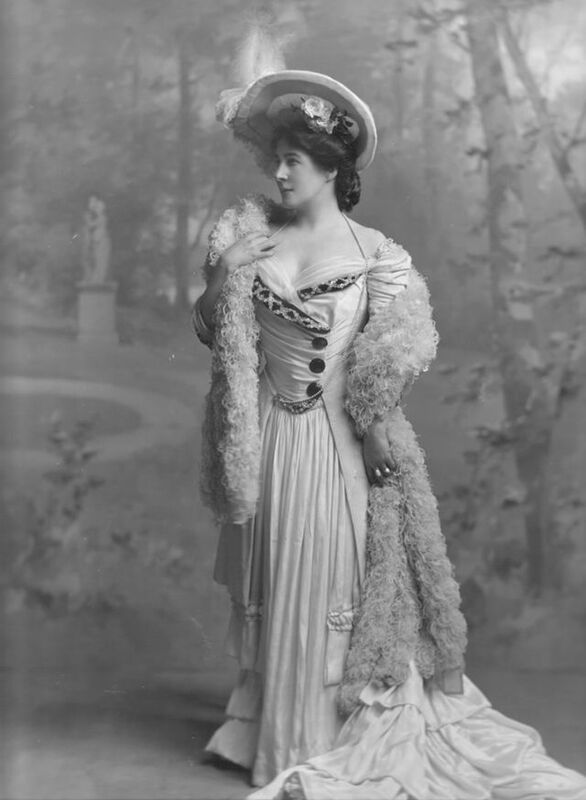 It seemed as if the infamous hatpin was causing quite a stir in the social and political atmosphere. How could this thin yet powerful accessory be brought to its demise? 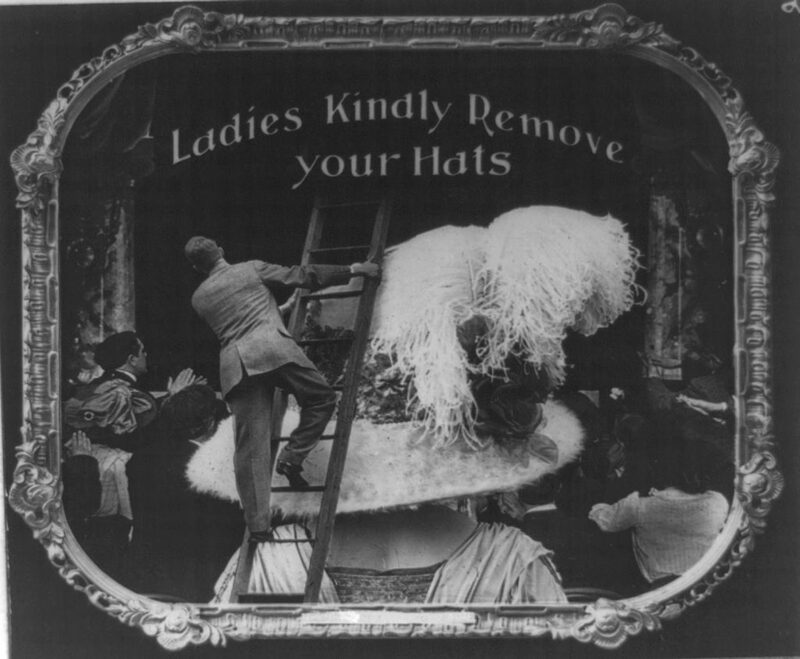 It wasn’t the implication of strict laws or even the number of injuries that forced the hatpin to retire its infamy. It was none other than a change of trend that made women everywhere ditch their immense crowns. 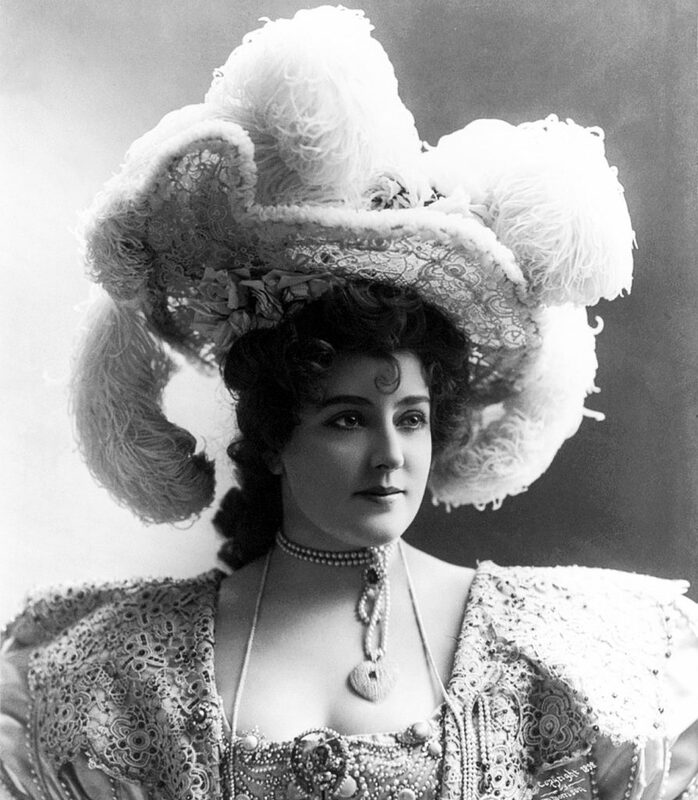 Large hairstyles accompanied by even larger hats were suddenly out of style. Women opted for the sleek “bob” haircut that was popularized by actress Louise Brooks. The Victorian inspired era of fashion was replaced by flapper swing dresses and delicate headbands. 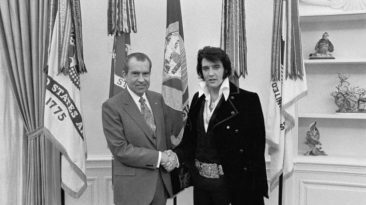 This change in fashion may have come to a relief for mashers during the time. 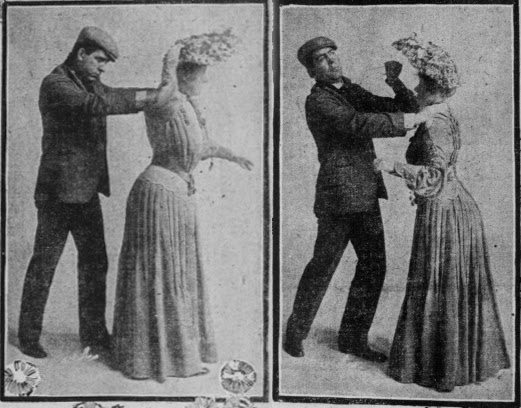 Although hatpins were “so last season,” women still managed to rise above sexual harassment and seek self-defense in other ways. The relevancy of women’s rights in the early 20th-Century is applicable even to modern times. Sexual predators are being exposed daily and have to face implications higher than a five dollar fee. The movement of women’s empowerment has evolved from a fashion statement to a demand for equality. 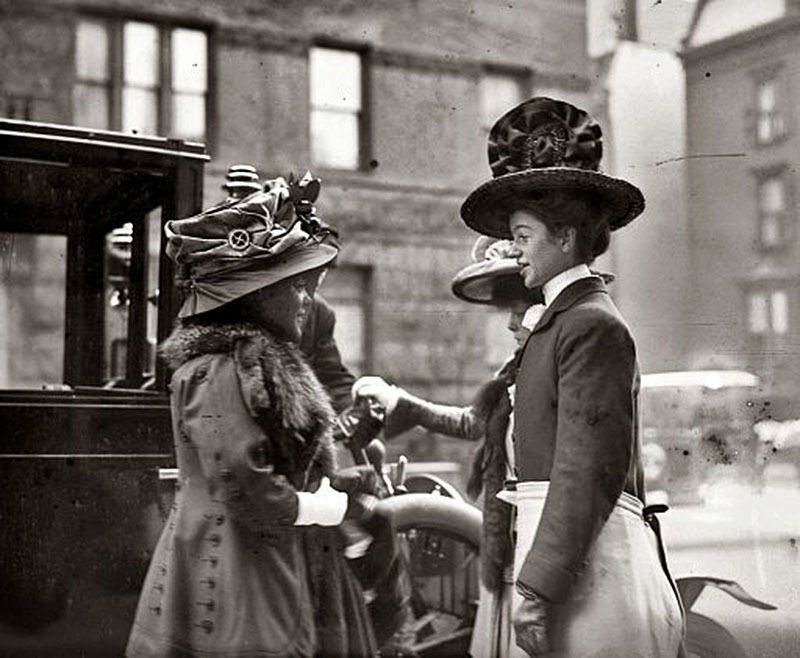 As the #MeToo movement brings needed awareness to the subject of sexual misconduct, it’s imperative to remember the humble beginnings of the hatpin. Who knew such a delicate and seamlessly hidden accessory could spark such a weighty revolution!